Day two of fun facts! Go here to read the first one. This FF has a great little story behind it. A year ago, Kristalyn of the blog, The Sarcastic Palmtree, followed me on Twitter. A few months later, there was a tweet about YALLFest and about wanting to go. We ended up deciding to go together. From there, our friendship grew. As I've said before, writing this book made me nervous. So nervous, that I wasn't going to write it. 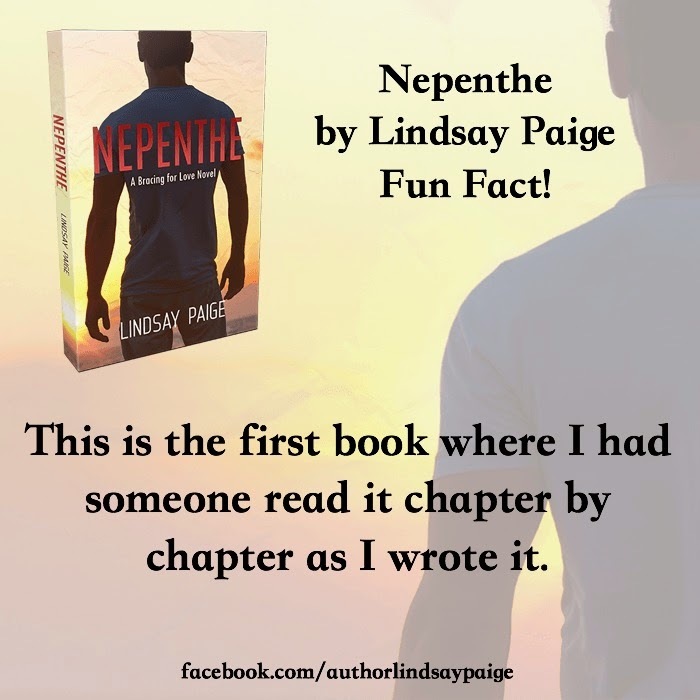 If you read Nepenthe, then you know this book is dedicated to Kristalyn and she's got a hunk of my acknowledgments. I asked her if she would want to critique the chapters as I wrote them. She said yes. With every chapter, I sent her an email. While she read it and constructed her own emails in return, I was writing the next chapter. We did this throughout the book, molding it to be the best it can be. This was the first time I've done something like this and it was such a fun experience. Not only did I get back helpful feedback, but I gained a best friend. Come back tomorrow for another fun fact. In the mean time, you can enter a giveaway to win ebooks from the Bracing for Love series!